Dame Jean Iris Murdoch (; 15 July 1919 – 8 February 1999) was a British novelist and philosopher. Murdoch is best known for her novels about good and evil, sexual relationships, morality, and the power of the unconscious. 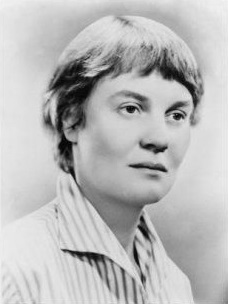 Her first published novel, Under the Net, was selected in 1998 as one of Modern Library's 100 best English-language novels of the 20th century. In 1987, she was made a Dame Commander of the Order of the British Empire. Her books include The Bell (1958), A Severed Head (1961), The Red and the Green (1965), The Nice and the Good (1968), The Black Prince (1973), Henry and Cato (1976), The Sea, the Sea (1978, Booker Prize), The Philosopher's Pupil (1983), The Good Apprentice (1985), The Book and the Brotherhood (1987), The Message to the Planet (1989), and The Green Knight (1993). In 2008, The Times ranked Murdoch twelfth on a list of "The 50 greatest British writers since 1945". Love . . . is the extremely difficult realization that something other than oneself is real.